She used the wrapping floral shops use to keep it all together. I remember mom using the stem of a leaf but for long-lasting durable leaves, you may want to use another material to wrap the base with. If it’s going to be in a vase, any tape would do as long as it was covered. I even made some and just used regular scotch tape. 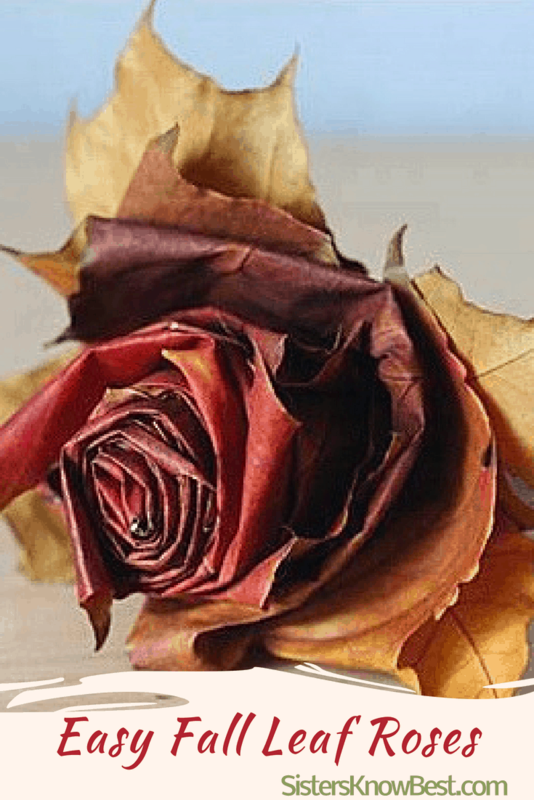 See this post for ways to preserve dried leaves. There is a tutorial below. 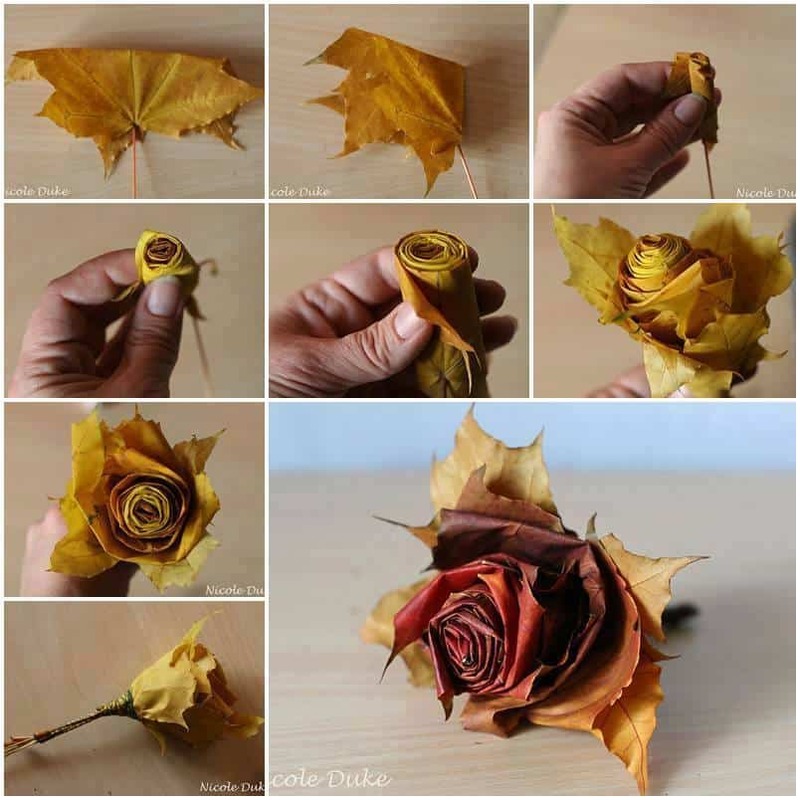 If you can’t find leaves where you are this Fall, check out these DIY tissue paper flowers! Begin with a smaller leaf. Placing the colorful side down, fold the points in. Begin to roll the leaf from one side. Take a second leaf and fold the center point down. Place the first rolled leaf in the center, fold down the side points on the second leaf and wrap both sides around the first. Continue to add leaves, rotating the flower as you go to get an even size. Use larger leaves on the outside. Once you have the desired size, wrap the stems tightly with florist tape. Place a twig on the bottom and wrap with the florist tape. Tip: Keep the petals tucked in so that it doesn’t unravel. Good luck! We’d love to see how you do. Post your pictures on our Facebook page or in the comments below! 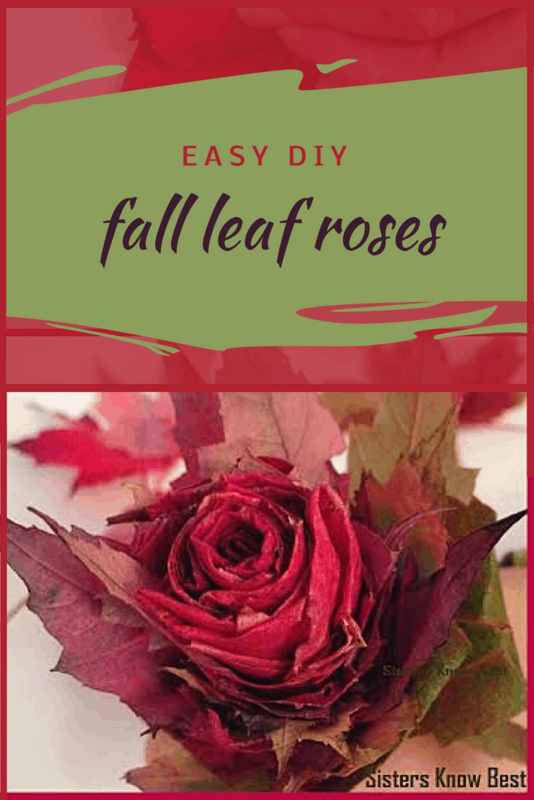 Foliage season is such a short season, I hope you can make many beautiful fall leaf rose bouquets! They’d be a lovely inexpensive gift for friends and family. Some people have used them as centerpieces for fall weddings and they are beautiful! If you are looking for another flower project that would last long into the winter, check out these beautiful and easy DIY tissue paper flower decorations. Please, share your completed rose with us! Sisters Know Best Facebook. Is there a step by step process on how to make these? Pictures don’t explain much. I added step by step directions to this! Good luck! Can you make a u tube video showing you doing it. Single Dad trying this craft with my daughters. Not looking like yours at all. Good luck! It’s great you are doing this project with your daughter! I’m unfortunately one of those people who can’t follow picture instructions all that well. Are there perhaps written instructions for this anywhere? I added directions to the tutorial now. I’d love to see your results! Post them to us on Facebook! Can you tell me where is this tutorial posted? How do you keep them from drying out? I will try this as it is the only one that doesn’t require me to buy anything extra AND it seems the most environmentally friendly, except perhaps for the waxed paper one. Many of the ones I made didn’t even use floral tape. We just tied a string around them and stuffed them down in to a vase. Best of luck! thank you fr the tip, I had been wondering about that. Does the color stay on these or do they turn brown? Should they maybe be sprayed with clear spray paint? Or ironed between wax paper to keep the color before making. Hi Chrissy, the wax paper technique might work. I just created a post http://sistersknowbest.com/2014/10/11/preserve-dried-leaves-flowers/ about preserving them. Hairspray is really easy and affordable and you can do that after you make them! Wax works good. I still have leaves I collected for school at age 13. I am not 67. The leaves are still green but brittle. Thank you but I can’t take credit for the pictures… Nicole Duke created them but I can’t find her to link to her. It’s a shame because I would love to find more of her stuff! I just had to pass it on for this season! I got all excited and thought, “Oh wow, I am going to gather leaves tomorrow! !”, THEN, I remembered that I just moved to Florida and there are not fallen leaves here. :(. Definitely going to try and make them out of artificial leaves!!!! Thanks so much for sharing. If they come out, I will definitely post them. The Dollar Tree has AMAZING artificial leaves (great color, shape, veining) that would work great. They come in packs of 50. They are real leaves that have fallen. I imagine you can use artificial as well. Do you soak these first? I’m wondering because around here, by the time the leaves have changed colors they’d be too dry to roll/fold/bend…. You can try that but I look for the ones that still have color. Low branched ones can be picked from the tree. I’m in Arizona without the beautiful Fall leaves. Do you, or anyone you know sell theme? is there anything you should do to leafs to keep them from crumbling, maybe soak them in something. can i copy this on paper? Do you mean use paper instead of leaves? What a great idea! I will have to try this also! Years ago I made roses from crepe paper and dipped them in wax. They were beautiful. That sounds like it will be beautiful! It frosted here as well so I am waiting patiently for things to heat up before I go collect more leaves. I’d love to see your wreath when it’s finished! That’s a great idea! Another reader is trying the same thing. You might want to experiment with how the leaves hold up or even try artificial leaves. Awesome! Congratulations to your friend! At the bottom there seems to be a tip about how to stop them from unraveling but I do not find it to be very clear. Maybe the hair spray or floral tape will help? You can use floral tape or even masking tape if you are putting in a vase and hiding the tape. The hairspray will stop the leaves from decaying. I’m going to try these with artificial leaves for my daughters wedding. How many leaves did you use for each flower? Ooo, great idea! I use 9 or 10 of them of various sizes. Try starting with smaller ones in the middle and bigger as you go out. I’d love to see a picture of this when you have it all decorated! Post to our Facebook page! Congratulations to your daughter! Try purchasing them at the Dollar Store or you can order artificial leaves from Unbeatable Sale or another online store. Please make a turtorial for the Leaf Roses!!!! Where can I find the glycerine? Most craft stores would have it. You can purchase it online too. I get mine from Unbeatable Sale. My daughter and I had such fun together making them today. What a great idea. Thank you for shearing. Excellent Jennie! So happy to hear this! I’d love to see your pictures on our Facebook page! How many did you make? Je suis désolé . Nous ne le faisons pas . Nous publions une vidéo plus tard aujourd’hui sur ce post si . Can’t wait to try this. I have always been “crafty” and love things you can do using free or very cheap items & turn them into something nice. One man’s trash is another’s treasure kind of person. Being a single mom meant I had to use my head instead of my pocketbook to decorate. Thank you for adding this to my list of crafts. I’m the same way, cheaper the better or FREE works for me! You’ll love my sisters post that is coming out soon then for repurposing wool sweaters she gets from Goodwill. Thanks for your comment! Getting married 10/25- attempting to use these in bouquets! Will post results! Thank you for sharing this. I LOVE it! I’ve heard a few people doing this. Try to preserve them or buy artificial from the Dollar Store or another store. 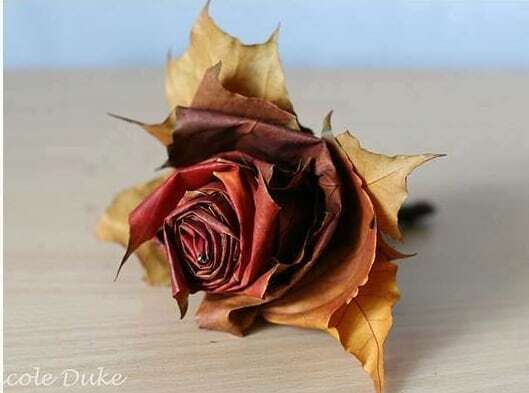 Our preserve post might help: http://sistersknowbest.com/2014/10/11/preserve-dried-leaves-flowers/ Best of luck with your wedding! These are stunning and confusing. Do you by chance have a youtube video, on how to make? It sure would be easier to watch it live. Thanks! Yes, you can view the video on my other site: http://www.waywardwanderers.com/fall-leaves-rose-video-tutorial/ They start out confusing but you get the hang of it pretty quick. Good luck! very nice!!!! move over Martha Stewart!! I enjoyed making these roses. They were really easy and fun. Thanks. We are so happy to hear that Carolyn! Feel free to post your pictures on our Facebook page and check back for up and coming projects! I made roses out of crepe(?) paper while growing up in Peru. U enjiyed doing it as it seemed almist therapeutc to me. I’m considering making some with my son some time as I’m not as craftsy anymore. I love this! Thanks for your comments. I bet the paper ones were awesome too! And they probably last as long. I encourage you to make them with your son! They are a fun little project and there is no wrong way with them. They all come out beautiful! This is funny.The only new thing about this, that has been created is it has been documented on how to make them.I am 65 yrs old and I remember my great-grandmother making them for wreaths,center pieces and we made them for in my hair with ribbons attached when I was little and always saved a few to use for decorating some Christmas gifts.It may have been a new craft created to you but many creative minds came before all of us..they just never had a video camera. Would spray clear urathane work to preserve? OR should I just use the hairspray? I want to make these precious roses to sell at a church bazaar! I have experimented enough to know what will hold up best. I do know glycerin give them a rubbery feeling. Hairspray is cheapest way. What a great idea! What a great way to use fallen leaves. I am now soaking mine in Glycerine; will remove after 24 hours and start folding! I did make a rose from a fresh “fall”…it turned out great!!! I bet it is going to be great! I have some that we didn’t do anything to for preservation and they have now dried perfectly. Frail but I will enjoy them this season and then begin anew next year. Good luck! I agree! There are a few people doing that. I can’t wait to see the pictures. I think the most important thing to take away from it is preserving them. Aw, that made my morning! I love this! Fall is my favorite time of year and these roses are perfect! We’re glad you enjoy them. I too love the fall! Years and years ago, I soaked some leaves in glycerin. I’m not sure the colors stayed true though. Thank you so much for sharing. Looking forward to making them. Thanks again. I love this idea and am certainly going to try it before all the leaves are gone! How creative & pretty! And those of you asking for step by step instructions if you would just read the article you will see them and even a video to help guide & show you how they did it. Many thanks & blessed be! Thanks for the enthusiasm, Goldilox! 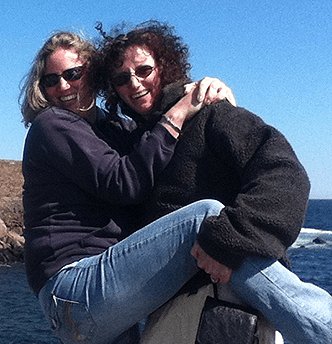 We LOVE your site! Have a spook-tacular Halloween!! Brilliant! i love your creative work! thanks for sharing! This looks like a cute little craft. I got a million leaves around me, I’ll have to try this. I made these and they turned out pretty good. I found leaves that were beautiful but a bit too dry so I put them in a bowl of warm water to wet them down a bit. What I didn’t do that I see here Is fold the outer leaves a bit to get that lovely rolled edge some of the petals have. I’m going to make a few more and try to post a pic later. Thanks for posting this great idea! Great! We can’t wait to see them! And good idea with the warm water also! I used maple leaves with good luck, then dipped theme in waz to keep them. They’re still looking pretty good! Thanks for the idea! Wax is a great idea to preserve your leaves! Thanks for sharing!! they are just awesome!!! it brings the fall to the summer. I agree! And if you preserve them, they really add to Thanksgiving! We’ve heard back from several people that they are doing that. I would recommend practicing in advance and making sure to preserve them. There is a link at the top of the page with options of how to preserve them. I made one last year that lasted for months without preserving it… but I didn’t use it for anything. Good luck on your wedding! We’d love to see pictures! Could be great for an eco-friendly fall wedding! I’ve already bookmarked this page for my imaginary future wedding ;P I don’t like the idea of cutting flowers and I love fall, so they would make the perfect bouquet or “floral” arrangements. What a great idea! Do you have a website? Send us an email through our contact page! That’s great! A lot of people have said they are doing that. I’d love to see the pictures after! Thank you! Your site is great too. Thank you for featuring us! This is so cool. My daughter and I will do this next weekend when she gets back from her trip. She is so bummed when our real roses stop growing that this will allow her to have some fun and make something that resembles her favorite flower! Thanks! That’s awesome! Make sure to share how they come out with us!